I couldn’t imagine a more spirited way of ringing in the New Year than an alcohol-suffused post. That it is coming a few days into the first week suggests just one thing: time-taken to …er… read through The Tulleeho! Book of Cocktails. The first book of its kind with a uniquely Indian focus, it is a store-house of information about mixology, including easy-to-follow cocktail recipes with accessible indigenous ingredients. Peppering the recipes are delightful trivia, anecdotes and facts, making this book a must-have for both the home bartending enthusiast, as well as, the most serious social drinker. The book introduces different kinds of alcohol, barware, glassware, mixers, condiments and garnishes needed to stock a home bar. It then moves on to types of cocktails, bartending techniques, tips & tricks. There is a section which provides basic information about different liqueurs and other popular spirits. The bulk of the book is made up of recipes while the last few pages have valuable information on where to shop for home bar requirements, alcohol calorie counter, hangover prevention and smart drinking. 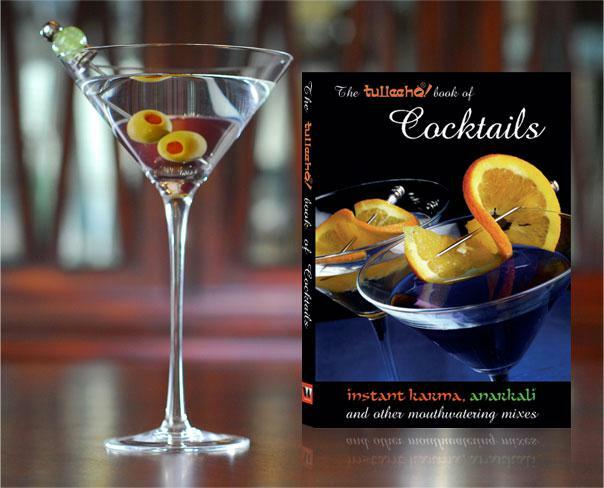 Edited by Rayna Jhaveri, and published by Westland Ltd., the book presents a variety of different alcoholic cocktails, the objectives being to enable you to make them yourself and not feel lost even though you may never have swigged one. Each section comes with a short history of the main base alcohol, some trivia, and preferred ways to serve it. Helpful descriptions of unusual ingredients and possible substitutes are also included in the recipe pages. Categorized into Tullee Tipples and Classics, the mouthwatering mixes include Dessert and Valentine’s Day specials. It also lists specials celebrating seasons (Monsoons) and festivals (Holi, Diwali, Christmas) while conjuring up delightfully named Jamuntinis, Anarkalis and Instant Karmas. Problem with cocktail books is that most of the key prescribed ingredients are not easily available in India. This one seems to have taken care of that issue. Personally, I find rum with rum, and a dash of rum the simplest and solidest cocktail to indulge in desi conditions. Hey, the proof is in the pudding. So when do we get to try out some of those delectables you mention?